OPEN exhibitions have been a popular feature at Leamington Spa Art Gallery & Museum since the 1930s and provide an opportunity to view and purchase a wide selection of works of art. Works submitted must have been completed after January 2018. Entries were welcomed from a wide range of media including painting, sculpture, drawing, printmaking, photography, digital media and craft. Works were selected by an independant panel of judges: Mark Essen, an artist who works across ceramics, sculpture and project based work. Annelise Hone, manager of all aspects of the six permanent collections displayed at Compton Verney and Jennie Moncur, best known for her large vibrant tapestries, as well as her flooring installations. 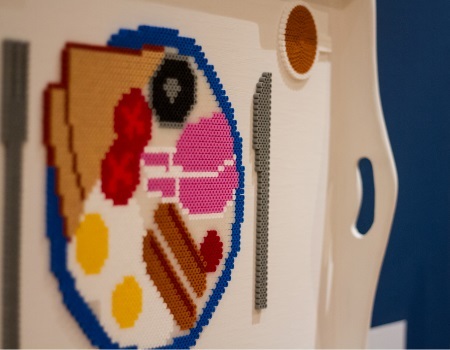 The winning artist of the OPEN 2019 Award was announced at the exhibition Preview as Lorsen Camps with his work ‘Breakfast in Bead’. He says about the piece; it is “An old tray I pulled out of a skip in Durham about 10 years ago. The tray sat in my loft for years until I had to decide what to do with it, I decided to create a breakfast tray and what better or more iconic than a full English. The use of Hama beads seemed a good choice I love their bright colours and the pixelated look they give. I like the concept of taking a material or medium that is seen as ‘unworthy’ and bringing it to the fore”. As the overall winner Lorsen has won the OPEN 2019 Award of £1000, an exhibition in our Spotlight alcove and the opportunity to give a Friday Focus talk on his work. Visitors to the exhibition can vote for their favourite artwork and the work of art which receives the highest public votes will be presented with the People’s Choice Award of £500.